This article was written by Donna Cromeans, Sam Dinsmoor, and Zandarl. Article edited by Donna Cromeans (@DJRiter). Article prepared for publication by Aimee Hicks. It has been nearly four years since a young actress was announced as the lead in a new series based on the comic book hero, Supergirl. It was a much sought-after role and Melissa Benoist was given the task of making the character of Kara (Zor-El) Danvers/Supergirl a believable and likable person without turning her into a caricature. Many wondered if she was up to the task. Since that time, Benoist has proven herself more than capable and has garnered worldwide praise for her take on the Girl of Steel. For the past three seasons, to the delight of fans and critics, she has grown and matured into the role. She has taken the role of Supergirl and made it her own, much like another young actor did when asked in the late '70s to portray the iconic role of Clark Kent/Superman. Following and perhaps due to a successful run on Broadway, Benoist has given Supergirl even greater growth and polish with deeper, richer acting. Never has that been truer, than in Fallout (4x2). In this episode, Benoist gives a stellar performance, at times seeming to channel the awkward comedic charm of a young Christopher Reeve. Performances such as this continue to add to her near-iconic status as the definitive Supergirl. For these reasons and others to follow in this article are why Melissa Benoist was named SpoilerTV's Readers' Choice Performer of the Month for October. ***Note, that in an unprecedented first she shares the title this month with Arrow's Katie Cassidy after a historic tie in the voting. An alien on this planet herself, and as it is just in her nature, Supergirl is nothing but sympathy for the president's plight and treatment. When she goes to see her, Benoist brings out that purity and goodness of Supergirl so well, as she's always done, when facing the president. 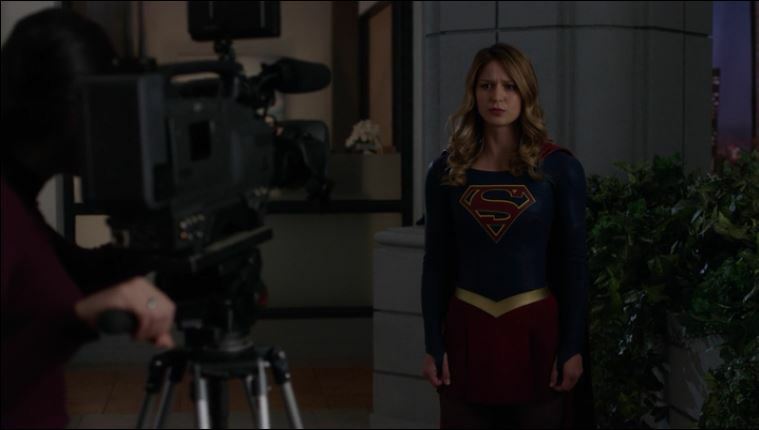 As Supergirl goes on and on to the president about the great things she's done for the country and how she deserves better, Benoist's display of total distress and desperation shines through. She shows you just how much Supergirl truly believes in her. As she goes on to talk about Mercy Graves and what she's done, you can sense the shift in tone in Benoist's voice from distress over Marsdin (Lynda Carter) to fear of Mercy Graves (Rhona Mitra) and what she's doing to this country. She is worried about the state of the country and its treatment over aliens and how Mercy is influencing them. But it is Marsdin becomes the comforter to Supergirl as she encourages her to be the beacon of hope the world needs. As Supergirl listens to her, soaking in every word, Benoist's eyes go from sadness, to hopeful, and finally to resolve. Benoist as Supergirl takes you on this emotional rollercoaster that you never want to get off. As Marsdin and Supergirl have this peaceful, loving conversation inside, the feelings of the crowd outside the White House is far from that. Both sides of protestors are violently angry and yelling and it's up to Supergirl to stop this before it goes too far, and she knows it, and Benoist does not take that responsibility lightly. But when she gets to them, she doesn't want to fight with them, her concern is just with getting everyone else to stop fighting. As she stands in her classic Supergirl pose (inspired perhaps by an iconic Christopher Reeve pose in Superman II) and speaks as the confident beacon of hope Marsdin wants her to be, Benoist makes it clear that most of Supergirl's strength does not lay within her arms but within her heart. 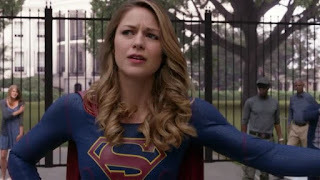 Despite her encounter with the angry mob at the White House, Supergirl returns to the DEO, ready to move forward following the exposure of the president as an alien, yet she still has faith in people. She affirms her faith in people, despite Alex’s warnings that things could get worse.. She only wavers slightly when the pragmatic Alex gives her visual proof of the growth of the hate groups on the internet virtually overnight. Once again Benoit shows a light to her character even when things seem bleak as you expect from the Girl of Steel. One aspect of Kara's life that the show has done well in portraying is her friendship with business mogul, Lena Luthor. This episode has several examples of how this is a true friendship with the two women confiding in one another, having sympathy for the other and at times trying to protect the other. Benoist and Katie McGrath have a nice chemistry together as these two friends. It is interesting watching Benoist portray both sides of interactions her character has with McGrath's Lena. Kara and Lena's friendship has been a constant despite Lena not being a fan of Supergirl at present. With Big Belly burgers in hand, she asks Lena about Mercy Graves and it seems they were close. Once again Benoist shines as a concerned friend as Lena confides in her that Mercy had been more like a sister to her, she conveys a warmth and empathy for her friend. Yet, she realizes and feels uncomfortable about deceiving her friend as shown by the discomfort she portrays when Lena mentions Superman, knowing she, herself is lying to her. However, it is the next sequence of scenes that Benoist shines best in this episode. One of the things that endeared fans to Reeves' portrayal of Clark Kent/Superman was a charming, geeky awkwardness he embodied in the Clark Kent character. Benoist pays homage to that awkwardness but gives us something not seen much with Reeves portrayal and that’s the frustration of not being able to slip away to become Supergirl to protect her friends. Benoist is masterful, showing impeccable comedic timing during these scenes. Just another indication of how much Benoist has grown into this role since being cast. Mercy Graves has attacked LCorp and Kara is trapped in the executive suite with Lena and Eve (Andrea Brooks). At the first sonic attack, as she tries to slip away to change into Supergirl in the guise of looking for a place to hide, she is thwarted at every turn by Lena who has gone into protective mode. When Lena hands her the sonic earplugs she moves as though to put them in until Lena turns away. Her exasperation shows on her face as she gives a huff and shoves the plugs into her pocket when Lena and Eve aren't looking. Then through sheer body language, her growing frustration is evident when she faces Lena and acts afraid but the fisted hands on her hips are all frustrated Supergirl. Next, all three actresses are to be commended on running through the atrium in high heels to get away Mercy's goons. How no one turned or broke an ankle is a mystery. But then, as though she's ducking from the bullets being fired at them, Benoist's Kara skillfully catches the bullets and throws them back at their attackers. Then, again deftly deflects Lena's concern saying they were terrible shots. Again, with her expressive face, Benoist shows her growing exasperation of the situation, when in the elevator with Lena. While the camera is on Lena, one can't help but notice Kara all but rolling her eyes at being thwarted again. Then, after the subtle super move of stopping the door from closing with her foot and feigning innocence saying the door must have malfunctioned, she almost gives herself away by immediately answering Alex who calls her on her comm. She covers nicely by acting surprised and flustered when she pulls her phone from her pocket to talk to her sister. Her voice conveys just the slightest edge to it, telling Alex she can't get away to become Supergirl. Her conversation with Alex is peppered with subtle hints to get her out of there. She bites her bottom lip before she says something that gives her away. Then, when they're out of time and the goons breakthrough, as Lena and Eve run away, out of the line of sight, she gives a super sneeze to knock them henchmen off their feet. And again, Benoist uses that near comedic geeky awkwardness by saying she forgot her allergy medicine. Her irritation is almost at its peak when she again tries to convince Lena to leave her behind, but Lena refuses to leave her. She reluctantly follows Lena to her secret lab. As she and Lena move through the lab Benoist subtly looks around as though searching for a place for Kara to go change. One can almost see the wheels turning in her head as she keeps looking for an escape. Then when they are confronted by Mercy, she reluctantly moves behind Lena at Lena's urging. Her discomfort at being in that position is clearly illustrated by Benoist's body language. Her voice and actions still showing Lena her fear, while the body language is tense and on-guard ready to spring into action. That telling crinkle is evident as she stands behind Lena as Mercy advances. Then she gives Kara a bit of false bravado when she pops out from behind Lena to declare that at least Lena wasn't a murderer. When Lena grabs the Lexo suit arm and prepares to do battle with Mercy, it's evident that for a moment Kara considers exposing herself to protect her friend. She adjusts her glasses as though she's made a decision, then throws her hands out when Mercy fires, only to have Lena's weapon stop the blast. Kara finally makes her escape and shortly after rushes back in as Supergirl. Benoist truly becomes Supergirl at that moment, her confidence firmly in place as she captures Mercy, and momentarily the tension between Lena and the superhero is eased. These scenes were Benoist at her best in this episode, switching from Kara feigning fear, to Kara showing her frustration at not being able to become Supergirl in an instant, often when other characters in the scene are not looking at her. All these moments were brilliance and showed Benoist in firm command of her character. With Mercy captured and, in a cell, back at the DEO, Benoist has a brief but solid scene with her favorite on-screen partner, Chyler Leigh as Alex. The timing of their dialogue when sparring with Mercy and Otis is impeccable, as always. It was also a wonderful display of the contrast of the sibling's dynamics between the Danvers Sisters and the Graves siblings. Though a short scene, it was another clear example of how good these two actresses are when in a scene together. Thankfully, the writers seem to have recognized this fact and have used such scenes more during Season 4. Later, Supergirl addresses the nation from Catco. Her heartfelt delivery shows her hope for humanity in her speech. Benoist’s words are conveyed with a convincing power and conviction. They are very relatable today, a steely resolve resonating in her eyes. At this moment she is the personification of that symbol of hope that former President Marsdin had encouraged her to be. She clearly shows that her heart aches for what is happening around her and the hate that is spreading, sharing her hope for patience and tolerance. It was very reminiscent of her powerful speech about hope that she delivered in the season one finale. Throughout the dark times, this season is illustrating Benoist continues to shine as that beacon of hope, showing great growth from the darkness that plagued her last season. 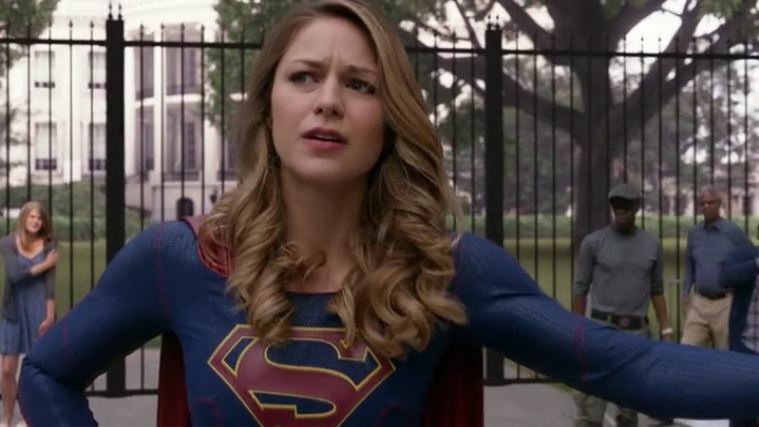 With the Graves' firmly behind bars, Supergirl returns to the White House where new President Baker (Bruce Boxleitner) is about to take office. He expresses concern that she was loyal to Olivia Marsdin, yet Benoist turns on her Supergirl charm and humility and reassures him that her loyalty lay with the office of the President and with the country that took her in as a refuge. Marking her first interactions with him with strength and a smile. Then there is a nicely added, human touch as she reaches up to straighten his tie. While Melissa Benoist has excelled in dramatic and action scenes as Supergirl, it is this slightly comedic turn as Kara Danvers in Fallout, that she has elevated her portrayal to the near iconic status. This episode shows how much she has grown as an actress in creating her vision of Supergirl/Kara Danvers. And, the exciting thing is that one suspects she's barely scratched the surface on the layers of her character, showing her ease in handling whatever the show's writers put before her. The sky is the limit for Melissa Benoist and whatever comes next is sure to delight viewers as she takes Supergirl/Kara to new heights. 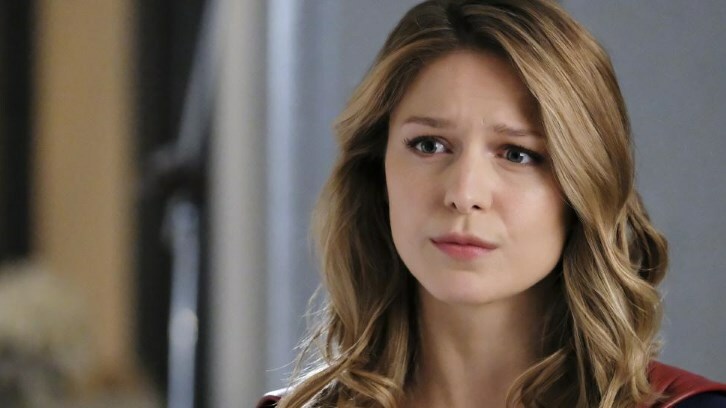 For all the reasons noted in this article, Melissa Benoist is one of SpoilerTV's Readers' Choice Performers of the Month. Please use the comments to discuss her performance in this episode and regarding her portrayal of Supergirl/Kara Danvers.